Islanders use whisky instead of petrol | What Car? 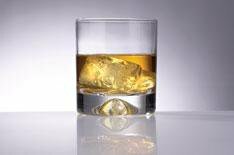 Scottish islanders are planning to beat high fuel prices by filling their cars up on whisky. The idea was sparked after petrol and diesel prices hit 128p and 145p respectively on the Inner Hebrides island of Islay. As a result, Donnie MacKinnon and friends Roland Worthington-Eyre and George Middleton decided they would exploit a legal loophole that allows people to distil whisky for personal consumption without paying tax. However, fuel prices will have to rise considerably before the plan makes economic sense. A 50-gallon barrel of whisky costs over 2000 before tax. A similar amount of petrol would be around 300. But Middleton says the key to the plan is being allowed to home brew whisky for personal consumption. He said: 'We know whisky makes cars go. The question now is will we be allowed to distil our own and instead of drinking it, just pour it into our vehicles. 'Its all about cost, but with the way things are going whisky may end up being cheaper than petrol.